The History of France covers the social, economic, political, military, religious and cultural developments from the prehistoric period to the modern day. Historians offer multiple overlapping, and sometimes conflicting interpretations, based on research into primary sources. The most prominent school of historians, covering the period before 1800, is the Annales School, but there are numerous other schools of historiography. The territories of Charlemagne passed in 843 to his three grandsons; Charles the Bald (823-877), Ludwig of Germany and Lothair I, the Emperor. Charles obtained all lands west of the Rhine, Ludwig the lands to the East of the Rhine and Lothair a long strip of land ranging from The Netherlands to Naples which embraced many languages and cultures and whose lack of national unity was to finally lead to its division amongst its more unified neighbours. The territories which Charles received were to form the basis of the modern French state. The monarchy overcame the opposition of the highly-powerful French barons over ensuing centuries. The monarchs eventually succeeded in establishing absolute sovereignty over France sometime in the 16th century. The history of modern France can arguably be dated to the election Hugh Capet (940-996), the Count of Paris in 987. Hugh's lands extended little beyond the Paris basin; his political unimportance weighed against the powerful barons who elected him. Many of the king's vassals (who included for a long time the kings of England) ruled over territories far greater than his own. A number of factors contributed to the rise of the French monarchy. The dynasty established by Hugh Capet continued uninterrupted until 1328. First, The laws of primogeniture ensured orderly successions of power. Secondly, the successors of Capet came to be recognised as members of an illustrious and ancient royal house and therefore socially superior to their politically and economically superior rivals. Third, the Capetians had the support of the Papacy which favoured a strong central government in France. This alliance with the Church was one of the great enduring legacies of the Capetians. The First Crusade was comprised almost entirely of Frankish Princes. As time went on, the power of the King was expanded by conquests, seizures, and successful feudal political battles. Philip II (1165-1223, reigning 1180-1223) provoked quarrels with two different English Kings - Richard I and his brother John - and when John refused to attend Philip's feudal court he seized the Plantagenet lands in Normandy, Anjou, Maine, Touraine, and Poitou and in effect returned their lands to the French crown. In the latter years of his reign, a successful Crusade against the Albigensian heretics won him the province of Languedoc. Philip also strengthened the royal hold throughout the country by his appointment of baillis, who had to further the royal interests in whatever way they could. The reign of Louis IX (1214–1270) (who became a saint) saw a further strengthening of royal authority with the establishment of the Parliament of Paris, a body of French lawyers and which became the principal court of the French state empowered to issued decrees aimed at curbing the powers of the barons. Philip IV (1268–1314, r. 1285-1314) established the Estates General which consisted of three estates: The nobles, the bishops, and the remainder (mainly the small urban middle classes, particularly the merchants). The parliament was not given legislative functions; the three estates sat as separate institutions and their sole purpose was the ratification of royal decrees. As time went on it was summoned less frequently, and after 1614 the monarchy stopped consulting the popular view so that between 1614-1789 the Estates General did not meet at all. Philip's reign was also important because of his row with the Papacy on the issue of clerical taxation. The dispute culminated with the seizure of Pope Boniface VIII in 1309 by the French army. The elderly Pope died within a few weeks as a result of his rough treatment. The succeeding Pope, Clement V, a Frenchman, moved the seat of the papacy to Avignon in Provence, which became the papal seat for the next seventy years. At this period Avignon was not in France, being instead nominally subject to the Holy Roman Empire. When the first line of the Capetians came to an end in 1328, Edward III of England claimed the French throne and the long Hundred Years War (1337 to 1453), at one time threatened the complete destruction of the French state. The first period of the war saw English bowmen assert their long standing reputation as the finest bowmen in the world, especially with their stunning victories over the legendary French Knights at Crécy, Poitiers and Agincourt. For around a century it seemed that France was delaying the inevitable by not bowing to the military might of the English army. 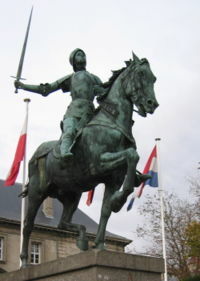 The tide did begin to turn in favour of the French in 1429, with the ascent of the charismatic peasant girl Saint Joan of Arc, who rescued the French city of Orleans in that year. She so inspired the defenders with speeches and passion that the English were forced to lift the siege. Although Joan was later taken prisoner and burnt at the stake in Rouen on charges of heresy in 1431, the English steadily lost ground and when the war finally came to a close in 1453, the French crown had won control of Normandy, Burgundy, Gascony and Guienne. The religious violence in 16th-century France erupted within the context of instability in municipal authority. There was normally room for tolerance of Protestantism in the community; in the early 17th century, a culture of religious coexistence existed based on the Edict of Nantes (1598), which gave the Huguenots (Protestants) considerable legal rights. There also seems to have a sort of routine tolerance in the everyday life of mixed communities, which remained almost normal as long as both churches were unable to shift back toward orthodox intransigence. Against this background, the agitation of the 1620s revealed how unmotivated the Protestants really had become, since their political fate had in fact been sealed around 1575, after the Saint Bartholomew's Day Massacre. By 162- the Huguenots were on the defensive, and the government increasingly applied pressure. A series of small civil wars that broke out in southern France between 1610 and 1635 were long considered by historians to be regional squabbles between rival noble families. New analysis shows that these civil wars were in fact religious in nature, remnants of the French Wars of Religion that largely ended with the Edict of Nantes in 1598. Small wars in the provinces of Languedoc and Guyenne show Catholic and Calvinist groups using destruction of churches, iconoclasm, forced conversions, and the execution of heretics as weapons of choice. Louis XIV acted more and more aggressively to force the Huguenots to convert. At first he sent missionaries to convert them, backed by a fund to financially reward converts to Catholicism. Then he imposed penalties and closed their schools and excluded them from favorite professions. Escalating the attack, he tried to forcibly re-Catholicize the Huguenots by the employment of armed dragonnades (soldiers) to occupy and loot their houses, and finally by the revocation (Oct. 18, 1685) of the liberal Edict of Nantes of 1598. The revocation forbade Protestant services, the children were to be educated as Catholics, and emigration was prohibited. It proved disastrous to the Huguenots and costly for France. It precipitated civil bloodshed, ruined commerce, and resulted in the illegal flight from the country of about 180,000 Protestants, many of whom became intellectuals, doctors and business leaders in Britain as well as Holland, Prussia and South Africa. 4000 went to the American colonies. The English welcomed the French refugees, providing money from both government and private agencies to aid their relocation. Those Huguenots who stayed in France became Catholics and were called "new converts." Only a few Protestant villages remained in isolated areas. Louis XIV supported the Gallican cause that gave the government a greater role than the pope in choosing bishops, and gave the government the revenues when a bishopric was vacant. There would be no inquisition in France, and papal decrees could operate only after the government approved them. Louis avoided schism--he wanted more royal power over the French Church but did not want to break free of Rome. The pope likewise recognized the the "most Christian king" was a powerful ally who could not be alienated. In the 17th century peasants had ties to the market economy, provided much of the capital investment necessary for agricultural growth, and frequently moved from village to village (or town). Geographic mobility, directly tied to the market and the need for investment capital, was the main path to social mobility. The "stable" core of French society, town guildspeople and village labourers, included cases of staggering social and geographic continuity, but even this core required regular renewal. Accepting the existence of these two societies, the constant tension between them, and extensive geographic and social mobility tied to a market economy holds the key to a clearer understanding of the evolution of the social structure, economy, and even political system of early modern France. Collins (1991) argues that the Annales School paradigm underestimated the role of the market economy; failed to explain the nature of capital investment in the rural economy; and grossly exaggerated social stability. French Protestantism, which was largely Calvinist derived its support from the lesser nobles and trading classes. Its two main strongholds were south west France and Normandy, but even in these districts the Catholics were a majority. Protestantism in France was considered a grave threat to national unity, as the Huguenot minority felt a closer affinity with German and Dutch Calvinists than with their fellow Frenchmen. In an effort to cement their position they often allied with French enemies. The animosity between the two sides led to the French Wars of Religion and the St. Bartholomew's Day Massacre. The religious wars ended in 1593, when the Huguenot Henry of Navarre (1553-1610), who was already effectively king of France became a Catholic and was recognised by both Catholics and Protestants as King Henry IV (reigned 1589-1610). The main provisions of the Edict of Nantes (1598), which Henry IV had issued as a charter of religious freedoms for the Huguenots, were as follows; a) Huguenots were allowed to hold religious services in certain towns in each province; b) They were allowed to control and fortify eight cities (including La Rochelle and Montauban); c) Special courts were established to try Huguenot offenders; d)Huguenots were to have equal civil rights with the Catholics. The military privileges were incorporated in the Edict in order to allay the fears of the minority. Over time it became clear these privileges would be open to abuse and when in 1620 the Huguenots proclaimed a constitution for the 'Republic of the Reformed Churches of France', the Prime Minister Cardinal Richelieu (1585–1642) invoked the entire powers of the state; He captured La Rochelle after a long siege in 1628. The subsequent Treaty of Alais left the Huguenots their religious freedom but revoked their military freedoms. The Treaty of Vienna in 1815 remodelled the map of Europe and set the stage for the ensuing century. Denmark lost Norway to Sweden due to its friendship with Napoleon. Sweden lost Finland to Russia, which also obtained most of Poland. The Holy Roman Empire (abolished by Napoleon) was not restored; a German confederation was instead established, a loose union of thirty nine states, with Austria and Prussia the most dominant powers. Austria obtained Lombardy and Venetia and in return ceded the Austrian Netherlands to Holland which formed a new kingdom under the House of Orange. Prussia obtained vital territories along the Rhineland, a reward for its crucial role in defeating Napoleon. Austrian influence remained supreme in Italy as branches of the Habsburgs ruled several northern duchies, and the Pope and King of Naples looked on Austria as its champion. In 1830 the French overthrew the Bourbons and placed Louis Philippe on the throne. The Belgians, with the aid of the new French monarch and the British succeeded in winning its independence from Holland. In 1848 revolutions broke out on a larger, European-wide scale. In France, Louis Phillipe was deposed and a Republic established under Louis Napoleon, nephew of the great emperor. By 1852 Louis Napoleon changed his title to Emperor Napoleon III. The Second Empire (1852-70) was notorious for the failures of Napoleon III, as France was decisively defeated by Germany, and lost Alsace and Lorraine. On the positive side the era witnessed the gradual acceptance of universal male suffrage, the establishment of large-scale industrial capitalism, a massive improvement in communications, and the birth of impressionism in art. In early summer 1940 the German army prepared for its assault on the Anglo-French alliance. The campaign was based on three strategies, an operation in the Low Countries (Netherlands, Belgium and Luxembourg) to clear the lines, a major land operation against France and an air operation against Britain to keep the Royal Navy at bay and keep the allies apart. The campaign was a dramatic success - the defeat of the low countries took a mere 18 days. The defeat of France took less than five weeks. The French political establishment was completely crushed; they had lost to an enemy who had not outnumbered them, but the Blitzkrieg had left the French in utter dismay. Only at Arras did any worthwhile French counter attack take place, under the command of Brigadier Charles de Gaulle. Some British, Polish and free French forces scrambled across the channel at Dunkirk, and de Gaulle, who became the leader of the government in exile, declared, "France has lost a battle, but not the war". After the defeat of France, with an armistice on First World War hero, Marshal Henri Petain sent an underling to the carriage of to sign the capitulation on June 22, 1940, at Compiégne. To add to the insult, Hitler had the surrender signed in the same railway carriage in which Germans signed the Armistice in November 1918. France was to be disarmed; two million French soldiers were to be interned for work in the Reich; Alsace Lorraine was to be returned to Germany and northern France be under occupation under the Nazis. Roughly two-thirds of the country was put under direct German military control. The remaining part of southeast France, and the French colonies, were under a nominally autonomous government set up in Vichy, Auvergne. The Vichy government effectively became a puppet of the Nazi regime. Japan, not yet allied with Germany until the Tripartite Pact was signed on March 25, 1941, still asked for German help in stopping the flow of supplies from French Indochina to China. Japan was permitted to occupy French Indochina starting in late 1940. De Gaulle and the Free French forces assisted British campaigns elsewhere in the war. Major political changes occurred in the post war years. Most of the leading politicians of the Third Republic - except Léon Blum - were unable to revive their careers. The once powerful Radical party fell into decline, winning only six percent of the vote in 1945. The Communist Party under Maurice Thorez emerged as a powerful party - many of its members had been active in the French Resistance and this was exploited politically. They were under orders from Moscow not to jeopardize the war time alliance and the opposition of the popular Charles De Gaulle meant claiming full power was out of the question. The socialists, although working together with the communists deeply distrusted them, especially after witnessing the rise of one party states in Eastern Europe following the war. A new party representing Christian socialists and progressive Catholics was founded, the Mouvement Republicane Populaire (MRP). Its leaders were resistance heroes from the war, such as Georges Bidault. All the mainstream parties supported the French Resistance Charter which called for a more just social order and 'the subordination of private interest to the general interest'. Nationalisation and social reform along the same lines of Britain was also gaining popularity. Coal mines and the four biggest banks in the country were nationalised. Social insurance was improved in April 1946. In October 1945 elections for the constituent assembly were held. The three main parties garnered most of the vote; the communists with 26%, the MRP with 25% and the socialists with 24%. De Gaulle was made head of government. The Assembly prepared to draw up a constitution for a new republic. The Assembly's first draft was rejected in favour of a more conservative document the second time round in June 1946. ↑ Roberty Gildea, France since 1945 (Oxford, 2002) pp. 37-40. This page was last modified 17:59, 1 November 2014.